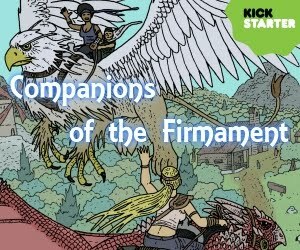 Companions of the Firmament is a supplement that is compatible with the Pathfinder Roleplaying Game. It provides support for both game masters and players to take to the skies in their fantasy games with flying mounts and develop rewarding stories for campaigns. Currently under development, lookout for the upcoming Kickstarter campaign to bring it to print.